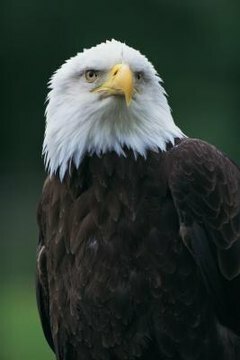 The bald eagle was chosen as the national emblem of the United States in 1782. It is the only eagle that is unique to North America. Defenders of Wildlife estimate there are about 70,000 bald eagles in North America. The golden eagle is the largest predatory bird in the U.S. It primarily lives in the western regions from Alaska to Mexico, although some may make an appearance on the East Coast. Bald eagles tend to live around water habitats in Alaska and Canada but colonies are scattered across the U.S.
At the start of the breeding season, male and female bald eagles work together to build a nest, usually at the top of a tree. The nests can measure 8 feet in diameter and weigh one ton, according to Defenders of Wildlife. After mating there is a gestation period of five to 10 days before the female lays between one and three eggs. She incubates them for 35 days. The golden eagle female lays between one and four eggs, but only lays one egg every three to four days, with two being average. This provides an approximate idea of the period between fertilization and egg laying. Incubation lasts an average of 42 days and the hatchlings spend another 32 to 80 days in the nest.